Online shopping is available with us through Euronics. Depsite being re-directed to www.euronics.co.uk throughout your online shopping process, please be assured that you will still receive our highly reputable customer service from engineers who you know and who you can trust. We offer a Click and Collect service from store as well as Delivery, Installation and Disposal services. There are hundreds of Euronics dealers throughout the UK, below is a simple guide to selecting us as your preferred dealer. 1. 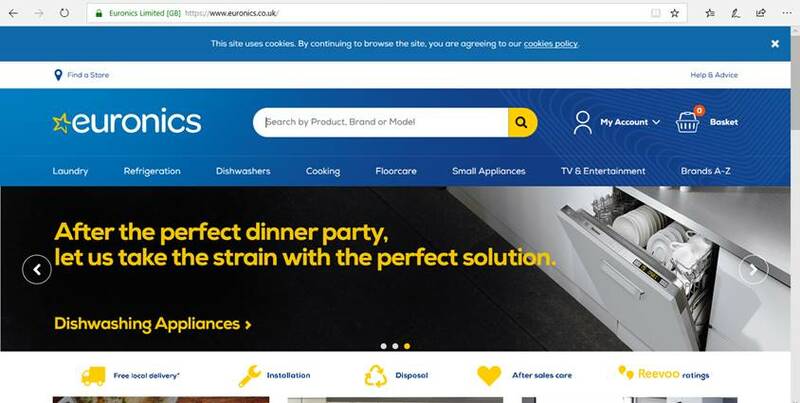 Once you have browsed the Euronics site and chosen your required appliance you will need to sign in, or provide your email to check out as a guest. Continue with the checkout procedure providing your required personal details. 3. At this stage Euronics will use your postcode to automatically find and select your nearest Euronics Dealer. If your preferred agent is not showing you must change this by using the drop down menu. For our services please select 'Princes TV And Video'. This should read 'We have paired you with your local store. Princes TV and Video. 4. Now complete your payment information and proceed with the order. You will receive an order confirmation number, followed by confirmation to your email/phone number. Euronics will notify us of your order, we will contact you to arrange your collection or to arrange delivery and installation of your new appliance.